The European Commission said the firm had used the mobile operating system to illegally "cement its dominant position" in search. The firm's parent Alphabet has been given 90 days to change its business practices or face further penalties of up to 5% of its average global daily turnover. However, it could easily afford the fine if required - its cash reserves totalled nearly $103bn at the end of March. "This will change the market place," she said. Google's chief executive Sundar Pichai has blogged in response. "Rapid innovation, wide choice, and falling prices are classic hallmarks of robust competition and Android has enabled all of them," he wrote. "Today's decision rejects the business model that supports Android, which has created more choice for everyone, not less." "Once you have it, it is working, very few are curious enough to look for another search app or browser," she said. Yandex in particular has benefited from this. Since the change in June 2017, the Moscow-based firm has seen its share of mobile search rise from about 34% to 46%, according to Statcounter. The European Commission first began scrutinising Android in April 2015, after a complaint by Fairsearch - a trade group that originally included Microsoft, Nokia and Oracle among its members. A trade body representing mobile operators has also greeted the development. "This will enable consumers to benefit from a greater choice of mobile services, and allow more players to innovate and offer new services in the market," said the GSMA's chief regulatory officer John Giusti. 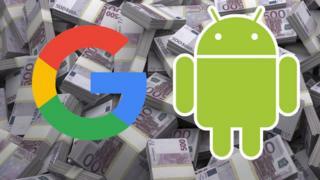 The European Commission had the power to fine Google up to 10% of its annual revenue. Based on its last annual report, that would have amounted to a maximum of $11.1bn (£8.5bn). The €4.3bn figure is, however, a record-sized sum for the commission. But today's ruling shows the gulf that has opened up between US and European competition policies. In the States the focus is on real and obvious harm to consumers in the form of higher prices or less choice. They also seem more sympathetic to the tech giants' argument that they can be easily toppled from their perches by feisty start-ups. European regulators tend to take a wider view of markets, worrying about a "winner takes it all" world, where a few mighty platforms appear to offer consumers a shiny world of free or very cheap goodies, but in reality are devoted to crushing any competition. This culture clash isn't going to fade away any time soon. 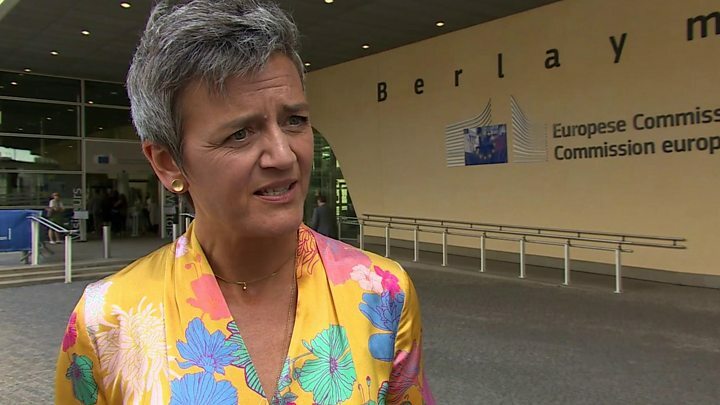 Cheered on by many who are concerned about Silicon Valley's dominance, Ms Vestager will not abandon her mission to tame the tech giants - and the likes of Google, Apple and Amazon will fiercely resist any regulation that they see as a threat to their lucrative business models.